Oligoclase is probably not a familiar name, even to gemstone collectors. It's actually a mineralogical name referring to a member of the plagioclase feldspar group. Several members of the plagioclase feldspar group have been valued as gemstones, including moonstone and sunstone. In this article we look at a rare transparent green oligoclase. The plagioclase feldspars form a series with varying chemical compositions. At one end of the series is albite, a sodium aluminum silicate; at the other end is anorthite, a calcium aluminum silicate. Most plagioclase feldspars are a hybrid, containing both sodium and calcium. In the case of oligoclase the sodium/calcium ratio ranges from 90:10 to 70:30. 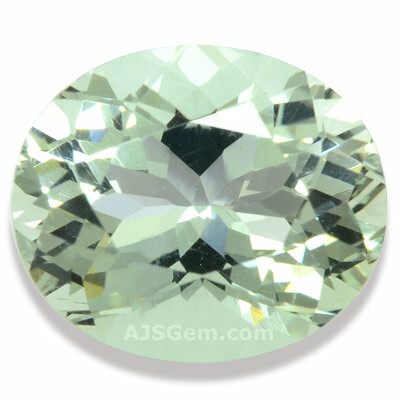 Oligoclase has a hardness of 6 to 6.5 on the Mohs scale and a density of 2.62 to 2.67. Its refractive index is 1.538 to 1.550 and it forms crystals in the trliclinic system. Transparent gem-quality oligoclase is very rare. 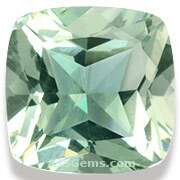 But specimens of transparent green feldspar have been found in both east Africa (Kenya) and Vietnam. Sometimes these are identified as amazonite, a potassium aluminum silicate. But amazonite is always translucent to opaque, and the transparent green feldspars we have found are plagioclase (calcium aluminium silicate). So we believe the amazonite identification is mistaken. Only a small quantity of this material has been found. 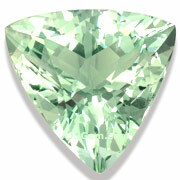 The color is a pastel bluish-green and the higher quality stones are quite clean. The material is completely natural and untreated.